The national surge in bicycling since 1995 may have more to do with healthy hips than with hipsters. 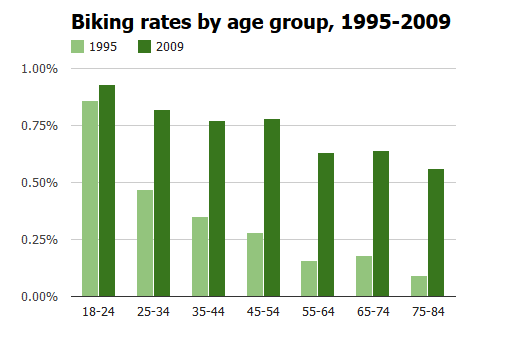 Biking rates among people between the ages of 60 and 79 are soaring, an analysis of federal data shows. New trips by seniors account for 22 percent of the nation’s growth in adult biking. And because biking among children is actually falling, these seniors’ new trips are equivalent to more than a third of the overall gain in biking. Source: National Household Travel Survey. Vertical scale measures share of all trips taken by bicycle. 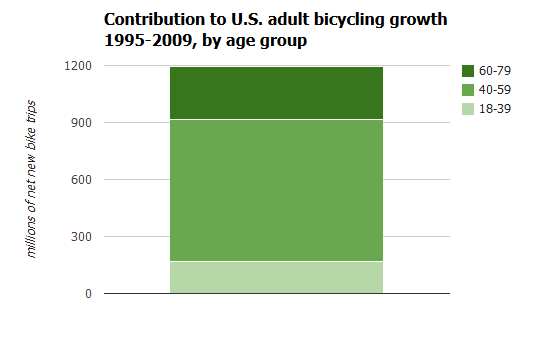 As recently as the Clinton administration, biking was for the young. Riding a bicycle over the age of 55 was very rare; riding over the age of 75 was almost unheard of. Even today, the rapid drop in car use among young adults sometimes leads to assumptions that Millennials have been driving the nationwide boom in bike trips... Nope, not necessarily. There’s no question that Generation Y’s tendency to favor city life and its declining enthusiasm for car ownership has boosted bike transportation. But as the older Civil Rights Generation and the Baby Boomers who followed them have entered the last third of their lives, they’ve quietly transformed what it means to be the kind of person who rides a bike. Between 1995 and 2009, the most recent year for which National Household Travel Survey data is available, the rise in biking among people ages 60-79 accounted for 37 percent of the total nationwide increase in bike trips. Rebecca Serna of the Atlanta Bicycle Coalition said she’s seen the trend in her own family — her father began riding regularly just after retiring, she said — and in the people who show up to her organization’s adult bike safety courses. But there’s a catch, Lawler said: though a rapidly growing share of older people would like to ride, American cities built during the last 60 years don’t make it easy for most people to do so.